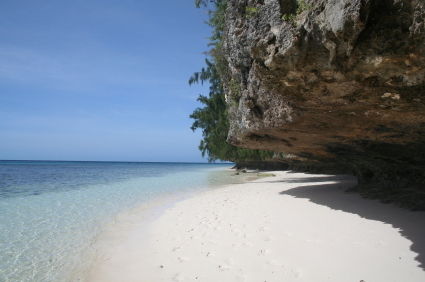 The most well-known site is Peleliu Cut. At its shallowest, this reef lies in 10m of water, with walls that drop off steeply to the depths. 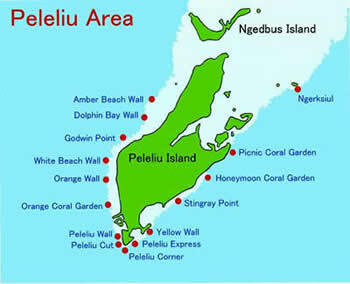 There are other sites around Peleliu, one worthy of mention being Yellow Wall which is just to the east of Peleliu Cut. The site gets its name from all the yellow soft corals that grow here and in addition you'll see a good variety of hard corals on the wall that drops to a sandy shelf at 45m. Sharks can often be seen at this lower depth. Reef fish, including butterflyfish and angelfish are ever-present. In close proximity are some other less well visited sites including Peleiu Camp, Peleiu Drop-Off and Peleiu Wall. Palau is made up of many islands with the most populous being Peleliu. With the exception of Anguar Island, this is the most southerly part of Palau. It was the scene of extremely heavy fighting between US and Japanese troops during WW2. More than 12,000 servicemen, on both sides, lost their lives over the two month battle. Seasons: Diving in the islands of Palau is similar throughout the year, although the best months are from December to June. In December, January and February there is a chance to see mantas. From February until May there is an increased number of sharks which come to these waters to mate. And in June and July the visibility in the lagoon in between the islands is excellent.